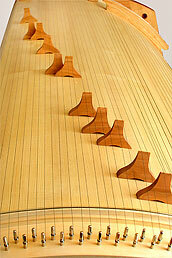 The sound bed or flat monochord—as it is sometimes called—is used in sound and music therapy. The stable construction of the 2-m long instrument conveys a safe and secure feeling. 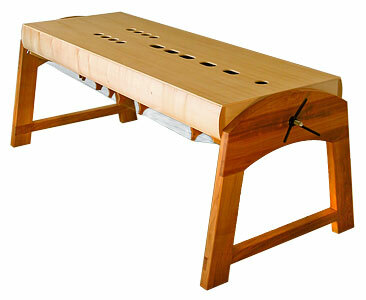 In India the sound bed has been used in therapeutic healing for centuries. The person lying on the sound bed is being played on from below. The acoustic sound experience of the complex harmony and the physical perception of the vibrations have a directly stimulating effect on the body. Harmonious sounds can arrange water molecules in a perfect pattern—healing through sounds all the way down to the cell structure! The acoustic openings on the surface of the sound bed correspond to the chakras and the knees of the person lying on it. If the playable side (with the strings) is rotated to the top (rotation process), the sound bed is converted into a luxurious polychord and offers unimagined possibilities in experimentation and sounds.